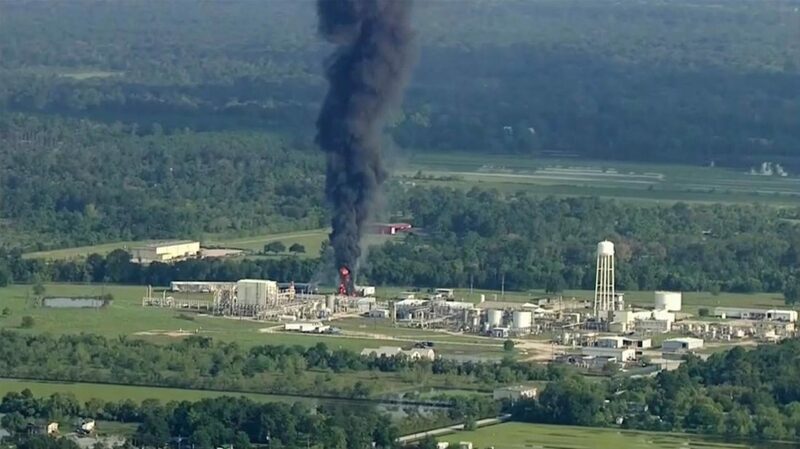 HOUSTON (AP) — Thick black smoke and towering orange flames shot up Friday after two trailers of highly unstable compounds blew up at a flooded Houston-area chemical plant, the second fire there in two days. A 1½ mile buffer (2.4 kilometers) around the plant was established Tuesday when Arkema Inc. warned that chemicals kept there could explode. Employees had been pulled, and up to 5,000 people living nearby were warned to evacuate. Officials remain comfortable with the size of the buffer, Rachel Moreno, a spokeswoman for the Harris County Fire Marshal Office, said Friday evening. Early Thursday, two blasts blew open a trailer containing at least 2 tons of material, sending up a plume of black smoke and flames 30- to 40-foot (9- to 12-meter) high in the tiny town of Crosby, about a half-hour from Houston, authorities said. The Texas environmental agency called the smoke “especially acrid and irritating” and said it can impair breathing and inflame the eyes, nose and throat.